The Indian government is growing less tolerant of debate and dissent each day. This is immensely troubling. Greenpeace India is struggling to pay salaries to its Indian employees as an uncertain future awaits its 400 odd workers, who are primarily working on environmental and civil rights. The Indian government has revoked the license of the civil society group and frozen its account on the grounds of an alleged violation of the Foreign Contribution Regulation Act (FCRA), a law regulating foreign contributions to ensure that they are not used against the Indian national interest by individuals or entities. Greenpeace is now pinning its hope on the judiciary to give it some relief. But Greenpeace isn’t the only NGO under pressure; there are around 9,000 NGOs in India whose licenses have been revoked since Narendra Modi became India’s prime minister. These sorts of open and blatant attacks on dissent by a democratically elected government is a disturbing development and raises questions about the intent of the Indian government. Can anybody who raises the issue of the environment or human rights be termed anti-national? Is the government the only trustee of the national interest? How far is it justifiable to trample on democratic dissent in the name of economic development? Earlier this year, Greenpeace activist Priya Pillai was offloaded from a flight to London at the Delhi airport. She was on her way to give a presentation to British members of parliament about the alleged atrocities against the tribal people of Mahan in Madhya Pradesh. Mahan is one of the oldest sal forests in Asia. A few large corporations now want to displace its inhabitants to mine coal reserves. Various factions of Indian civil society have rallied against the displacement of the indigenous community in Mahan and elsewhere. The Modi regime terms this sort of activism anti-national. The civil society groups question this mode of development, which involves the mindless displacement of people without taking into account history, culture, or sustainability. “The political stand that we have taken on coal mining and the nuclear issue—that is the issue. This government is not tolerant towards dissent and very aggressive against civil society groups,” Pillai told The Diplomat. Another prominent NGO, the Sabrang Trust, is also under the government’s eyes. The trust, led by social activist Teesta Setalvad, came into prominence due to its support for the victims of the Gujarat riots of 2002. The group was one of the leading voices against the Modi government in Gujarat, which the NGO blames for presiding over the religious riots of 2002 as well as ignoring the plight of the hundreds of victims who were ultimately forced to live in refugee camps. With Modi now at the helm of affairs in Delhi, the Trust has come under intense scrutiny and its patron has been blamed for financial embezzlement. A Supreme Court intervention saved Setalvad from imprisonment a couple of months ago. The method to Modi’s madness in clear. Those civil society groups that question the government’s model of economic development and its policy towards religious minorities are at the receiving end of the government’s wrath. “Anybody who is questioning Hindu rights and business interests is the target,” says Richa Singh, an activist who runs Vaada Na Todo Abhiyan (“Don’t Break The Promise” campaign), a campaign on government accountability. There is a strong perception that the government is indulging into vendetta politics, particularly with Setalvad, who has been one of the persistent campaigners for the victims of the Gujarat riots. Two of India’s Nobel Laureates, Mother Teresa and Kailash Satyarthi, are the byproducts of civil society activism. Their activities in Indian society enriched the country. Their NGOs have been dependent on foreign funding as well. It was due to civic activism that India got the Right to Information, Right to Food, and Right to Education acts. By targeting non-governmental organizations, the Modi regime is attempting to silence the conscience keepers of Indian society. Some activists meanwhile question the government’s silence on the funds being received by NGOs affiliated to the Rashtriya Swayamsevak Sangh (RSS), the ideological godfather of the ruling party. Dissent and debate are integral to a democratic society, but there is now a systematic attempt to silence questions in India. A recent incident at the Indian Institute of Technology (IIT) in Chennai, where a student organization was banned at the instruction of the central government because it was raising uncomfortable questions regarding the religious polarization of Indian education by the Hindu right-wing government, is a case in point. The government wants to control voices on college campuses as well. This is a matter of concern for all the right thinking citizens of this country. In this growing battle between the government and civil society groups, liberalism and democracy are at stake. 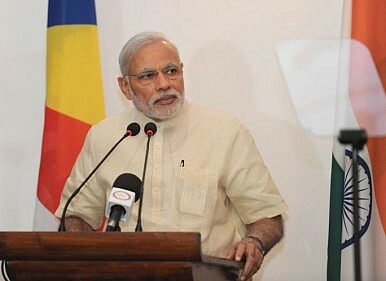 On India's 70th independence day, Narendra Modi laid out a wide vision, touching on several themes.